Bvlgari is known for the sophisticated timepieces, the beautiful creatively designed jewelleries, the refined scents of fragrances and their exceptional Resorts. The name Bvlgari stands for creativity, luxury, style and quality. Over the years watch manufacturer's labels intend to expand, by being creative and adding high tech to their new designs. 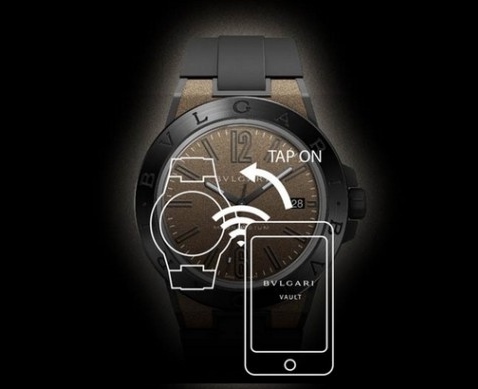 Bvlgari is also one of these exclusive labels that is innovative and comes out with new technique and design. Beneath the rugged look of the Bvlgari Diagono Magnesium Concept watch lies a whole new path. 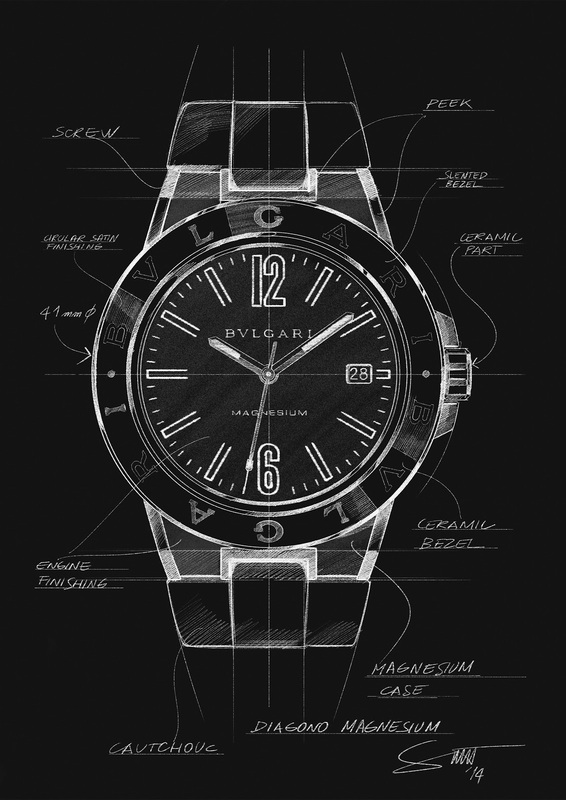 The release of the Bvlgari Diagono Magnesium concept watch was announced at Baselworld 2015 in March this year. The Bvlgari Diagono Magnesium Concept watch has a tough guy look, yet sophisticated and featuring high tech that you would not expect to be included in a luxurious timepiece. 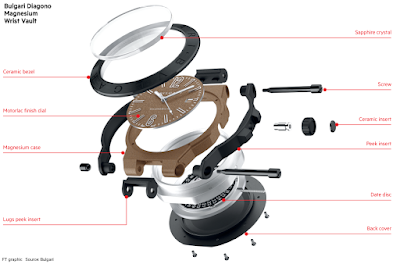 The advancements in this watch gives a whole new dimension to timepieces. The Bvlgari Diagono Magnesium is named after the material that has been used on the center of the case. This material is uncommon to be used in the watchmaking industry. Magnesium is a durable and extremely light material. It is 38% lighter and stronger than aluminum. Magnesium does not oxidize and corrode. If using Magnesium was not impressive enough, Bvlgari also add PEEK (Poly Ether Ether Ketone) to make it even more exclusive. PEEK is a polymer that is often used in space-tech, due to its temperature and structural resistivity. The Space shuttle industry is using PEEK instead of metal. 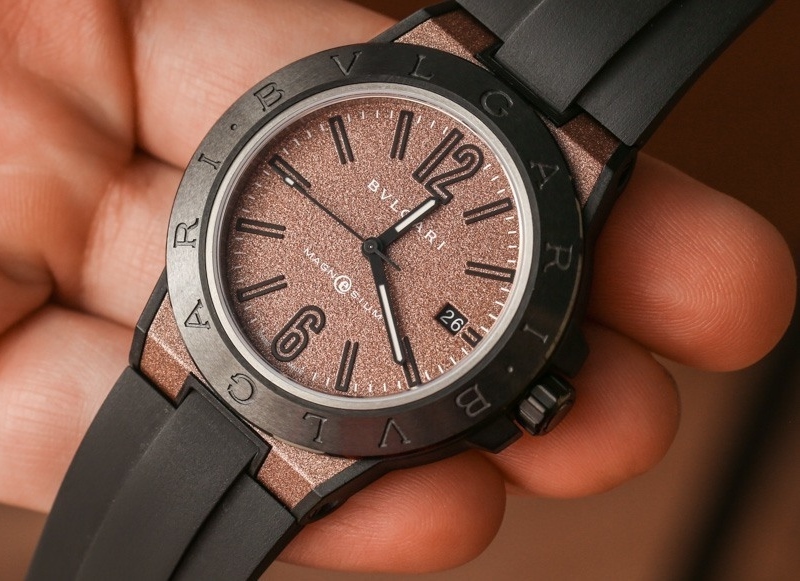 This has Bvlgari inspired to use it on their advance techno designed watch. PEEK is also used for the buckle that fastens the vulcanized rubber strap to the wrist. 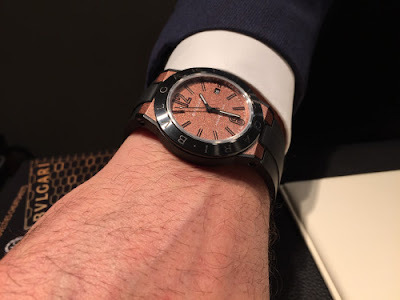 The Bvlgari Diagono Magnesium has a ceramic bezel. There is also a ceramic cap on the crown, which is like the back a PVD coated stainless steel. The dials match the color and finish of the case. The sanded grainy texture of the dial is a result of Motor Lac, which is a coating used normally to protect engine components in high luxurious cars, such as Ferraris and Maseratis, both brands Bvlgari is working with to develop this new creation. The Motor Lac coating allows for the additional colors: Anthracite, Brown/Bronze, Silver/Grey and Blue for the Bvlgari Diagono Magnesium. 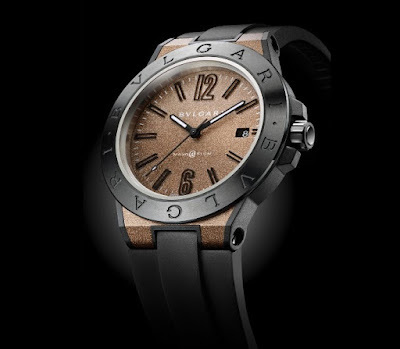 The Bvlgari Diagono Magnesium is a self-winding mechanical wristwatch with a 42 hour power reserve. Although it may look like just a high fashion and trendy watch, but it turns out also to be a high tech watch. 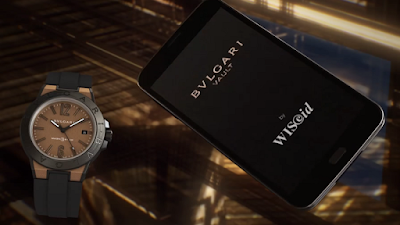 The advancement technology in the Bvlgari Diagono Magnesium is a result of Bvlgari partnering with the Swiss NFC (Near Field Communication) technology expert WISeKey. 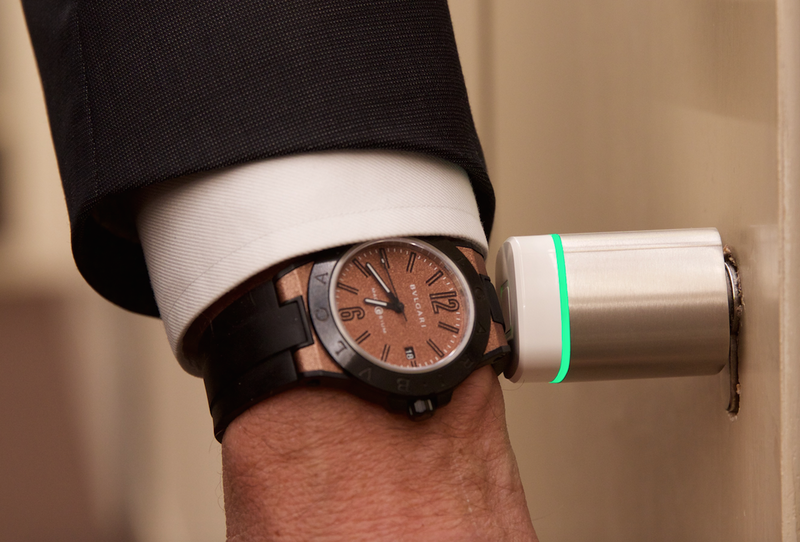 The Bvlgari Diagono Magnesium is a portable vault that will be worn on the wrist. There is a cryptographic chip inside the case, which is capable of unlocking an application that can store encrypted data and communicate with other devices within its range. 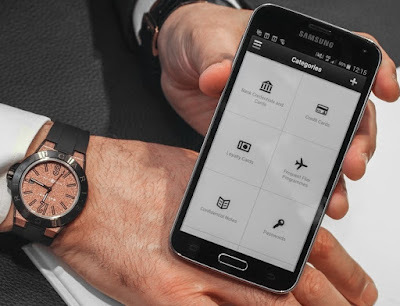 The vault app can store personal data and passwords, high resolution images of passports and identification, methods of payment and more. Basically you can see it as backups of our most important information. The storage of the data will not be on the watch itself. Via the direct link-up, all data entered on the Bvlgari Diagono Magnesium will be stored within a military protected Bunkers in the Swiss Alps. This is Top banking security level! 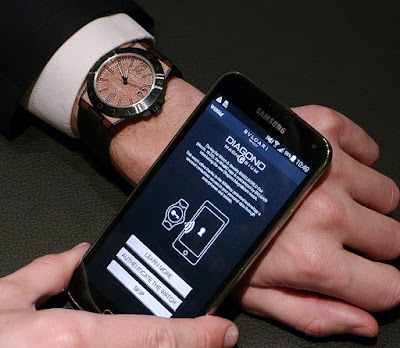 It requires double authentication, yet the person who wears the watch will have an easy access to it. You can use the Bvlgari Vault App to manage your details by connecting to your smart phone or tablet via the NFC interface. You might now be wondering how secure that will be? Well, let me reassure you, that the Swiss company WISeKey are experienced in the field of data storage and are already set-up with Android and iOS apps for securely storing passwords and credit cards. Their track record is genuine and reassuring. The Bvlgari Diagono Magnesium will also be able to unlock doors and car doors even without the App. These seem to be the debut services, since it can be expected from Bvlgari to have more planned out down the line. 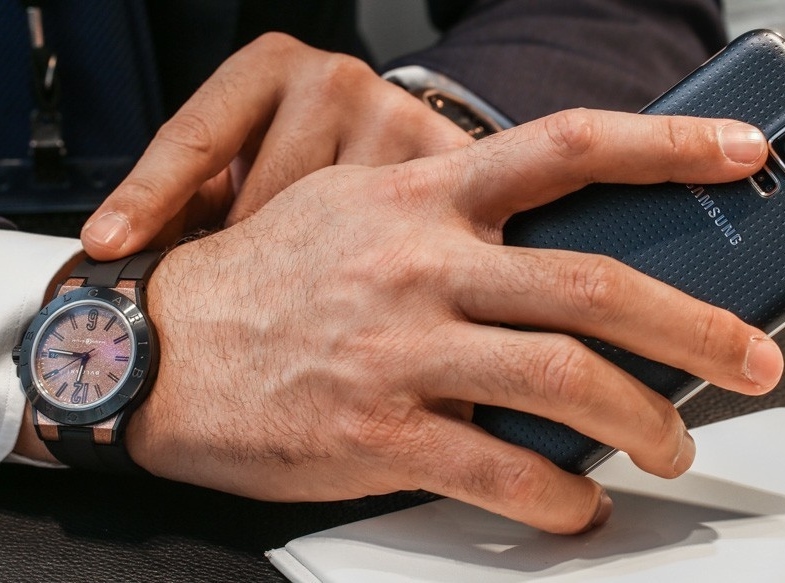 Without the NFC chip, the watch is available in 4 colours: Blue, Silver/Grey, Brown/Bronze, and Anthracite. 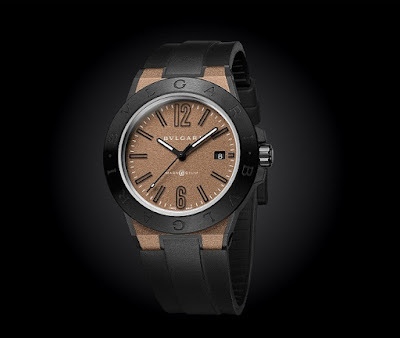 The Bvlgari Magnesium Concept is only available in Bronze for now. Right now the watch is still in development. 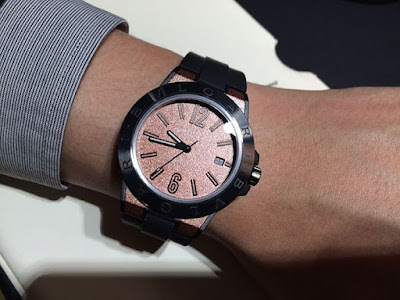 Bvlgari plans to release the Diagono Magnesium Collection this coming fall. 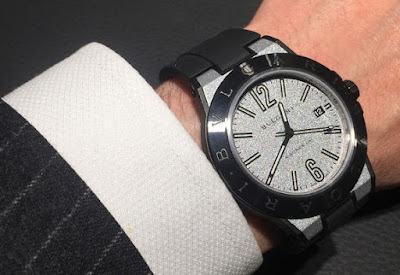 The Bvlgari Diagono Magnesium appears to be surprisingly affordable with a price tag of $4,600. However will the price remain the same when they release the Collection? The Bvlgari Diagono Magnesium seems to be referred as the Intelligent watch. So I guess we will just have to wait and see if this is truly a smart idea. 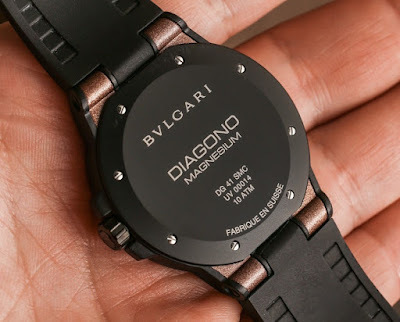 The sense of luxury factor in the Bvlgari Diagono Magnesium is definitely the combination of trendy and high fashion, yet sophisticated timepiece with the unimaginable high technology features. Captivating, mesmerizing and offering rare beauty in colors, more mysterious allure than the traditional clear color, the Pink and Blue Diamonds are stunning, sophisticated alternative to the traditional White Diamond. Sweet and enigmatic charm, clear as the deep blue sea, yet tones and sparkle with a more subdued allure. The Pink and Blue Diamonds exudes a modern, sweet and confident sense of style.